Spider-Man is a superhero who first appeared in Marvel Comics Amazing Fantasy #15 in 1962 by Stan Lee and Steve Ditko and first appeared in the symbiote costume in Amazing Spider-Man #252 and Secret Wars #8. The alien symbiote are a race of parasite that invade their host in the form of a costume, creating a bond in which the alien can influence the hosts mind. Actor Andrew Garfield portrayed the hero in the 2012 box office hit The Amazing Spider-Man and continues his role in the The Amazing Spider-Man 2 set to release in 2014. 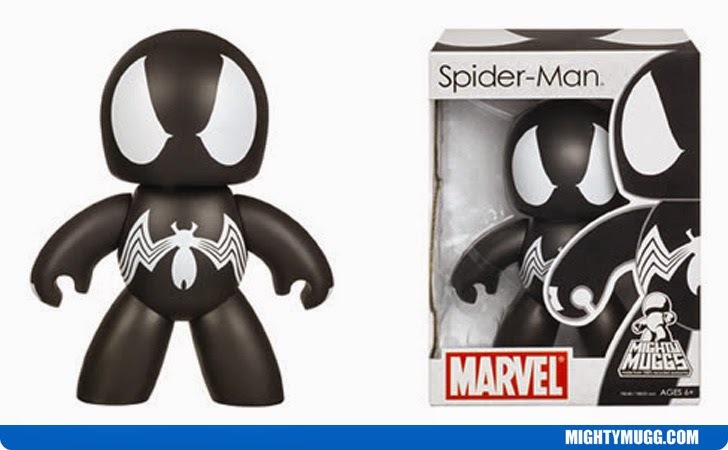 The Mighty Mugg above portrays Spider-Man in the black alien suit.